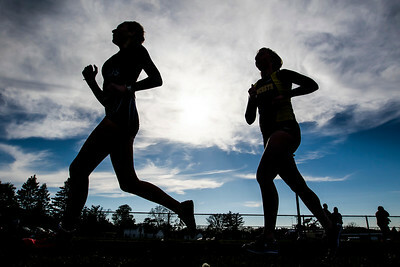 Sarah Nader - snader@shawmedia.com Runners compete in Thursday's Kishwaukee River Conference Girls Track & Field Meet at Marengo High School May 4, 2017. 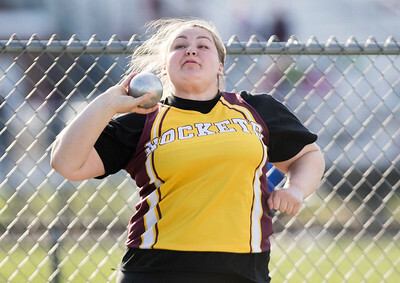 Sarah Nader - snader@shawmedia.com Richmond-Burton's Megan Curran competes in shot put during Thursday's Kishwaukee River Conference Girls Track & Field Meet at Marengo High School May 4, 2017. Sarah Nader - snader@shawmedia.com Marengo's Emily Euker (left) and Woodstock's Katie Steponaitis competes in the 400 meter dash during Thursday's Kishwaukee River Conference Girls Track & Field Meet at Marengo High School May 4, 2017. 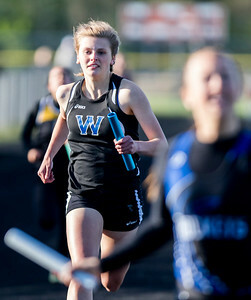 Sarah Nader - snader@shawmedia.com Woodstock's Syd Heidtke competes in the 800 meter relay during Thursday's Kishwaukee River Conference Girls Track & Field Meet at Marengo High School May 4, 2017. 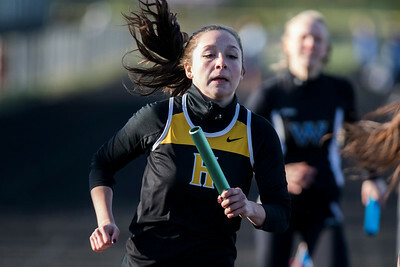 Sarah Nader - snader@shawmedia.com Harvard's Kylee Mortimer competes in the 400 meter relay during Thursday's Kishwaukee River Conference Girls Track & Field Meet at Marengo High School May 4, 2017. 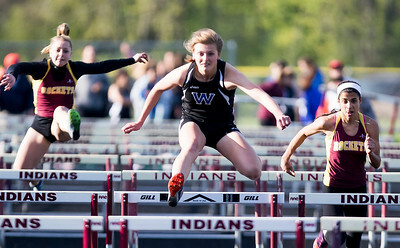 Sarah Nader - snader@shawmedia.com Woodstock's Syd Heidtke (center) competes in the 100 meter hurdles during Thursday's Kishwaukee River Conference Girls Track & Field Meet at Marengo High School May 4, 2017. 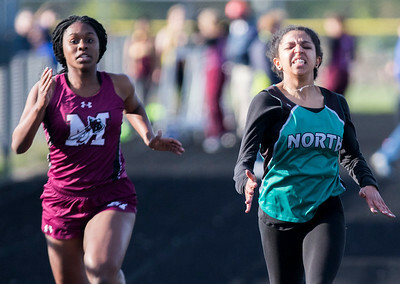 Sarah Nader - snader@shawmedia.com Marengo's Jordan Parker (left) and Woodstock North's Bria Livengood compete in the 100 meter dash during Thursday's Kishwaukee River Conference Girls Track & Field Meet at Marengo High School May 4, 2017. 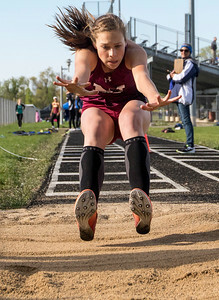 Sarah Nader - snader@shawmedia.com Marengo's Lillie Simons competes in triple jump during Thursday's Kishwaukee River Conference Girls Track & Field Meet at Marengo High School May 4, 2017. 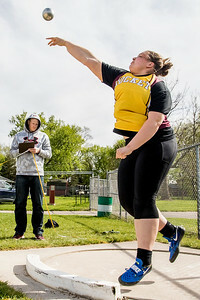 Sarah Nader - snader@shawmedia.com Richmond-Burton's KC Davis competes in triple jump during Thursday's Kishwaukee River Conference Girls Track & Field Meet at Marengo High School May 4, 2017. 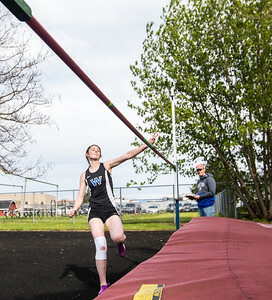 Sarah Nader - snader@shawmedia.com Woodstock's Kayla Deegan competes in high jump during Thursday's Kishwaukee River Conference Girls Track & Field Meet at Marengo High School May 4, 2017. Woodstock's Syd Heidtke (center) competes in the 100 meter hurdles during Thursday's Kishwaukee River Conference Girls Track & Field Meet at Marengo High School May 4, 2017.